At lunchtime yesterday, I left my office at Bevill State Community College to attend a chamber of commerce lunch meeting. The sky was tombstone grey with light mist falling. Cranking up my truck, I sat for a moment while the engine warmed and the wipers squeaked on the windshield, looking for water to swish. I rolled the driver’s side window down to wipe the mist off my rearview mirror. It wasn’t cold so I left the window down as I navigated the parking lot. A clicking sound came from somewhere underneath the truck. It changed rhythm as I slowed down, and that concerned me. Pulling to the edge of the parking lot, I stepped out to check the tires. The rear driver’s side tire had what looked like a piece of metal as big around as a kindergarten pencil wedged into the tread. Running my finger over the object, I couldn’t tell if it was stuck between the tread or jammed through the rubber. Had I pulled it free, there was a chance I’d have to change the tire. That meant that I’d have to get on the ground to reach the spare tire. So, I opted to go have the tire checked instead of attending the lunch meeting. I clicked down to Sayre Auto Parts and pulled up to the tire bay. They do all the work on my vehicles. The mechanic was there in a second and looked at the piece of metal. 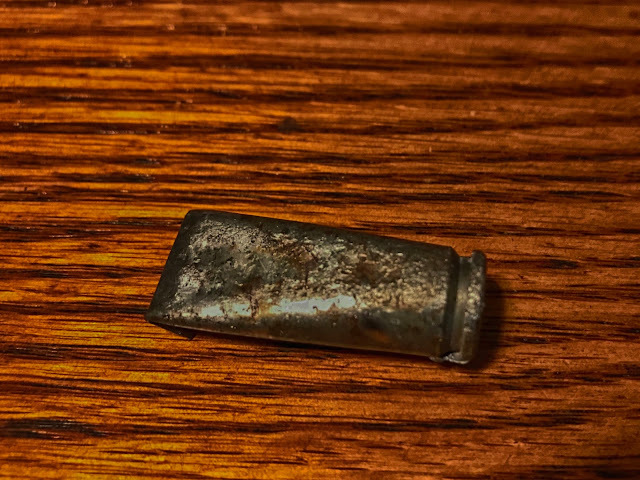 “That’s a bullet,” he said.” I thought he was joking until I had a closer look. It looked like a cartridge for a .357-magnum handgun. “I hope it’s a spent cartridge and not a live bullet” he said. I involuntarily stepped back. He removed the tire and took it inside. Sloshing soapy water on the area around the projectile, he looked for air bubbles. When he didn’t see any, he reached for his pliers and pulled the object free and held it up for me to see. The spent casing hadn’t damaged the tire at all. I was amazed. He bounced-rolled my tire back out and replaced it on the truck. You must drive in a tough neighborhood. It sounds to me as if you dodged several bullets. You didn't have to change the tire yourself. You didn't have to replace the tire. The bullet wasn't live. And the garage didn't charge. Lots of wins there. In my years as a gardener, I sometimes found spent shells and live ammo in shrubbery beds and even among flowers. It always left me with a weird feeling --something between uncertainty and fear. Let's all be careful in this dangerous world. Sometimes good things do happen. Glad it was your day to dodge the bullet ! Many things 'Spell Relief', Having dodged a bullet is definitely one! Good on you! It's a good thing that it was just stuck in the tread and not the tire, I agree this was a win for you all around. Now there is a story to write. 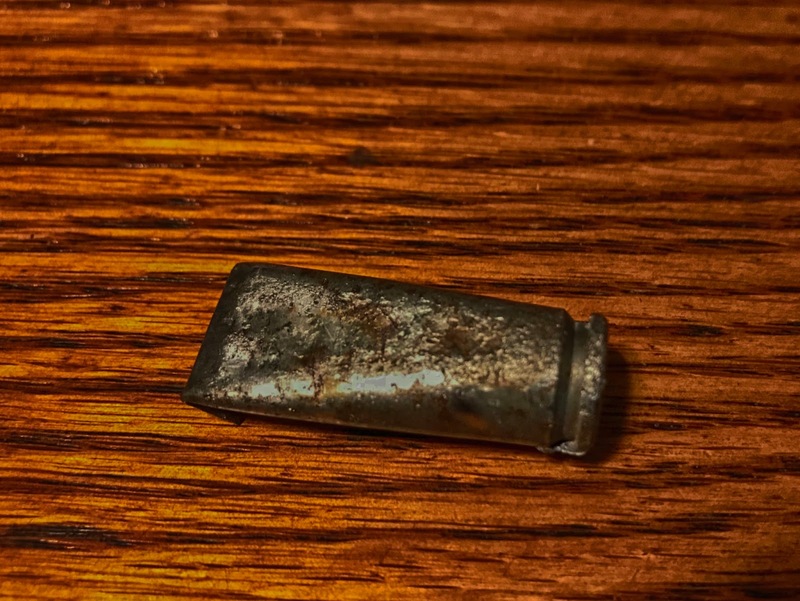 Spent bullet casing in tire. Finger prints, grassy knoll, age of casing. Hmm. Mind if I 'tread' on your dodging the bullet?